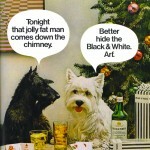 Vintage Ad Archive: Lifting Holiday Spirits! Here at Alcohol Professor HQ, it's long since begun to look like Christmas. The tree is trimmed, the halls are decked, the eggnog is spiked, and colored lights are covering every available inch of space. We've made our list, checked it twice, and just about nearly finished all our last minute shopping. The hi-fi is blasting carols at maximum volume. So therefore, it's the perfect time for me to take a minute, dig into the archives, and return to my favorite role as Alcohol Professor's very own resident Ghost of Christmas Past, whisking you on a trip back through time to check out some of the fine and festive ways liquor companies have used the Yuletide in their promotions! Whiskey is often considered an ideal beverage for the winter months, and distillers haven't been shy about capitalizing on that connection at every possible opportunity. Throughout the 20th Century, companies specializing in Scotch, Bourbon, Irish, Rye, and various blended varieties of Whiskey regularly incorporated visual elements of Christmastime into their end-of-year campaigns. Then came full circle by the early '70s, returning their focus to the cuteness and comedy of their canine mascots. And in a truly baffling turn of events, some companies tried to make their lack of distinctiveness a selling point in their holiday advertising. And then there's this, because apparently nothing says Christmas like a turkey raising a snifter. But as much as Whiskey is associated with the wintertide, it's hardly the only option at hand – much as there's space at the holiday table for everyone (no matter how grinchy), signature seasonal drinks can be based in a variety of intoxicants. For example, eggnog partners well with a few different liquors. In fact, nearly every type of tipple has gotten in on the Xmas action at some point; vodkas, gins, rums, cordials, apertifs, wines, and beers have all taken their turns in the seasonal spotlight. And even though I usually try to limit the scope of these articles to print advertisements published in the US and UK, just for space concerns (and the sake of my own sanity), I recently ran across this brilliantly bizarre poster from 1913 France, which is so brain-melting in its depiction of Xmas iconography, that I simply couldn't resist including it here for your perusal. That seems like an ideal way to wrap up this installment of Vintage Ad Archive... It sounds like our Professorial staff singalong soiree is about to get going, and I don't want to miss out on all the caroling and cocktails that will doubtless ensue. So, on behalf of all us here at Alcohol Professor HQ, I’d like to wish you and your loved ones all the happiness of the season. Fill your glass and drink a toast, because after all, there's nothing like a dash of spirits to make spirits bright!